Here are some pix of my new printer which Andy calls “Gigantor”. As you can see it is a work of such refined elegant design that it would bring Steve Jobs to tears. Actually Gigantor is at an awkward adolescent stage. If you wish to criticize please first change your Facebook profile picture to your 7th grade yearbook photo. Gigantor was built in an improvisational style using a lot of scrap from my shop. Most of the non 3d printer specific stuff was left over from other projects. I started with the guide rods and build out from there. 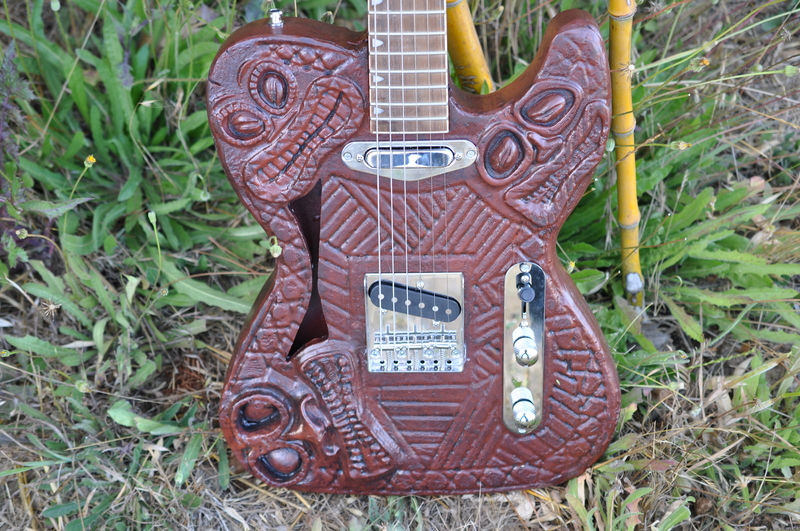 Rather than give directions to make your own I will point out some of the special or unique features. I built this printer for myself, not as an open-source project, so it uses tools and techniques which might not be readily available to everyone. It is the only 3d printer I have seen which has welded and CNC plasma cut parts. So just for the record I am not suggesting anyone try to duplicate this printer. Make your own out of whatever you have lying around. It’s much more fun. Build volume: 500mmx500mmx400mm The z axis could be brought up to the full 500mm with some easy modifications, but I have’t bothered yet. XY Motion Control Schema: Modified Ultimaker style. 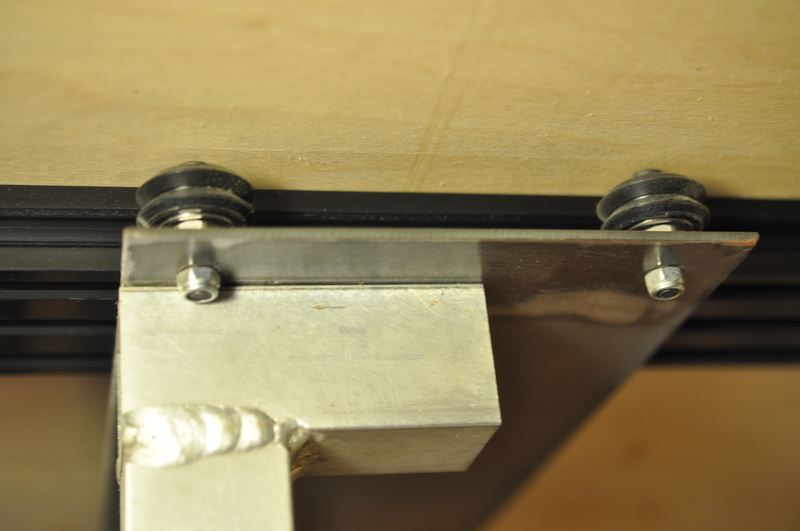 Z axis: Welded aluminum and steel frame driven by 2 leadscrews. Electronics: RUMBA board with TMC2100 silent stepper sticks and full graphic Smart LCD controller. NEMA 23 steppers on all axes. 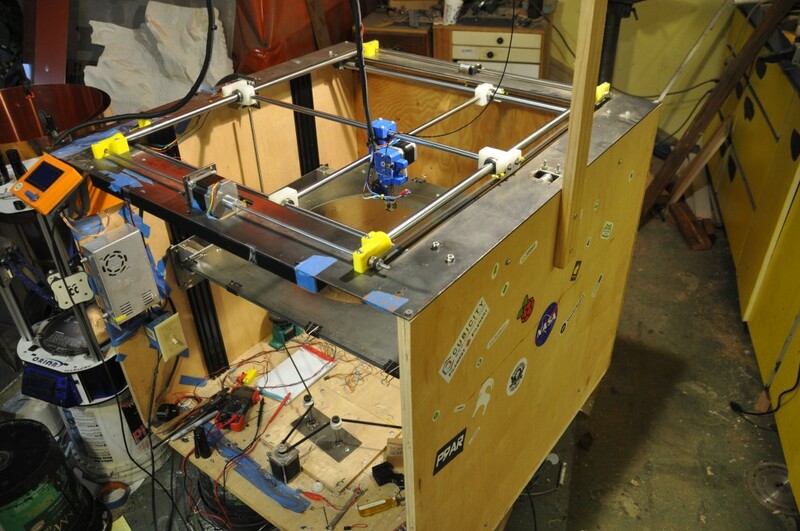 The printer is designed with the x and y axes built on the CNC plasma cut steel frame at the top. The frame is attached with drywall screws (only the most refined of engineering solutions here) to the rest of the printer which is made of plywood. 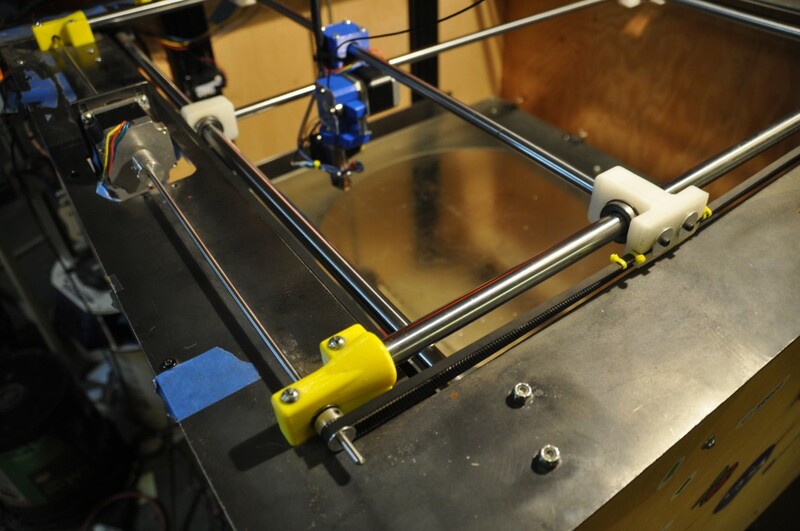 Many early 3d printers were made of laser cut plywood. Being larger than my entire laser cutter this plywood is table saw cut. This makes the z axis and the x/y easily separable modules. You could experiment with different x/y designs and easily swap them onto the z axis. For instance could have a corexy module which I could install in just a few minutes. The basic design is similar to the Ultimaker’s crossed guide rods, but I made some improvements (at least I think they are improvements). 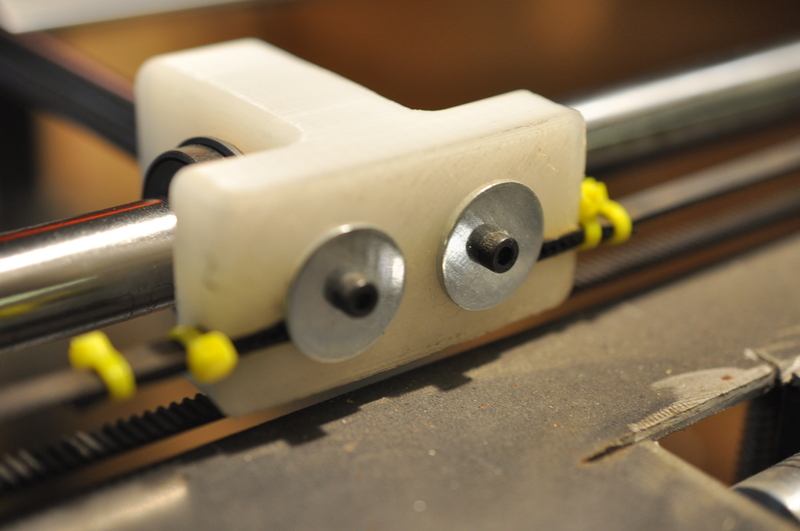 The original Ultimaker design uses rotating shafts which both guide the ends of the cross rods and transmit the motion from the steppers to the belts. It is an elegant design that makes the most of minimal parts and it makes a lot of sense for their commercial design. But when you scale a printer up the guide rods need to be a lot thicker to be rigid enough over the longer span. I am using 16mm rods where most smaller printers use 8mm. 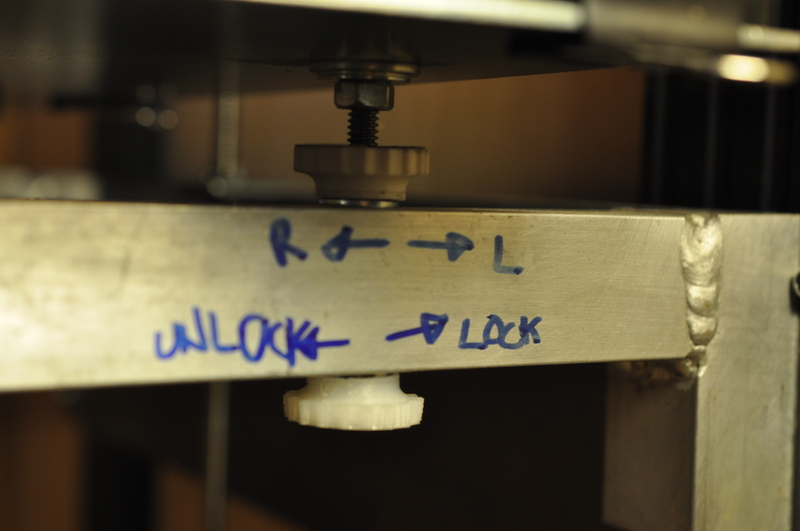 I separate the support and power transmission functions which are combined in the Ultimaker design. The heavy rigid guide rods don’t need to move and the jack shafts which transmit the stepper power to the belts are only 5mm in diameter so they can accelerate and decelerate quickly and smoothly. 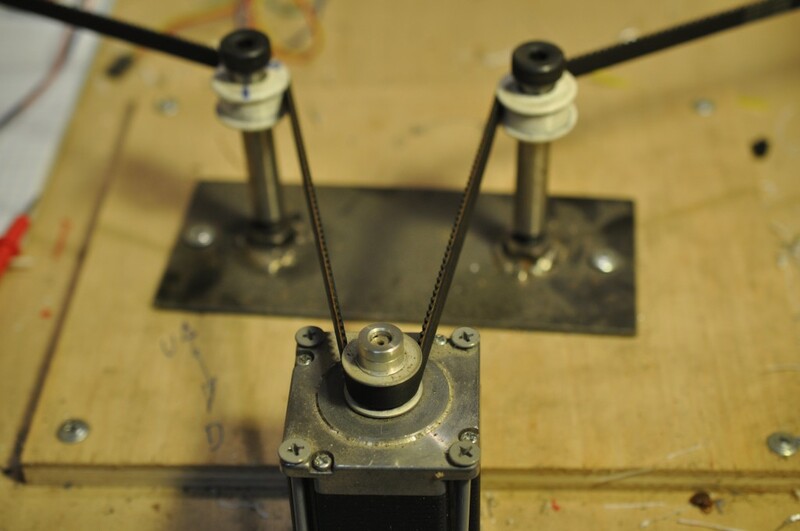 The jacks shafts attach to each end of double shaft steppers which avoids needing a belt to connect the stepper to the shaft, or the added width and other problems which could come from having the stepper drive the shaft from one end. The rod ends are printed with 618 nylon to withstand the strain from the belts. The integral belt clamps took a bit of work because they have to carry a lot of tension in the belts to avoid backlash. 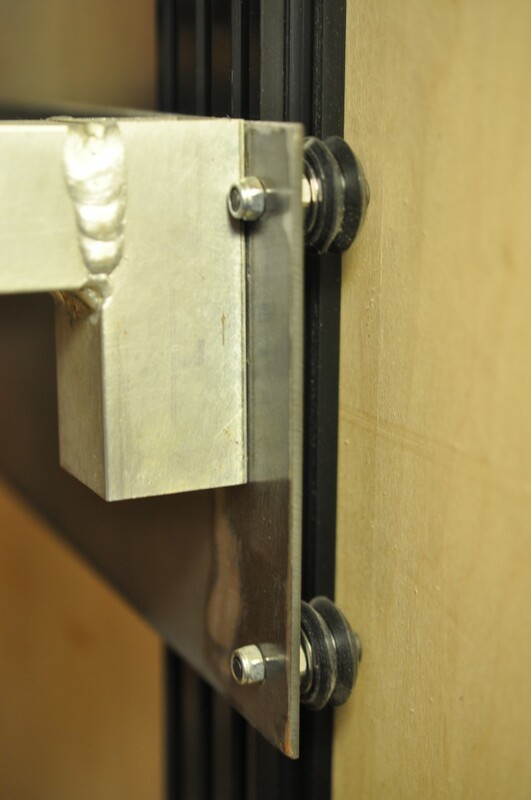 The fender washers keep to belts locked in the clamps while the bolts threaded through the layer lines add reinforcement. Gt3 belts would have been better here, but the gt2’s are cheap and so am I. I designed all the 3d printed parts in Cubify Design. The lower stress parts are printed in PLA. I have reamers which match the bearing sizes so all holes are reamed to size receive their linear bearings. They fit so precisely that when I ran out of retainer clips I just left a couple of bearings press fit in their housings and they have performed perfectly. I used some leftover openbuilds extrusion and v wheels to guide the z axis. It is very rigid and tight. 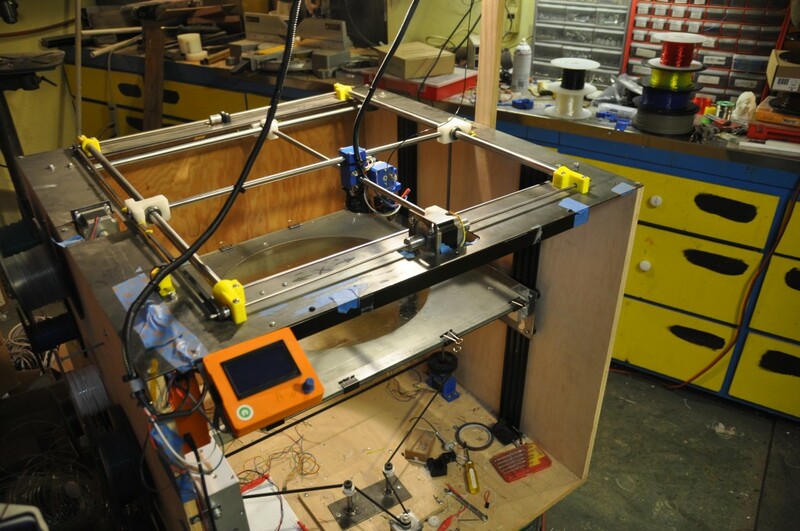 If I were starting from scratch with no materials and few tools I would build the whole printer from aluminum extrusion. It isn’t the cheapest material but it is very precise and easy to work with and can be cut well with wood cutting tools. The two sides are connected by some TIG welded aluminum tube. Rather than rely on spring loaded screw for bed leveling I use a printed knurled thumb nut on the top and the bottom. 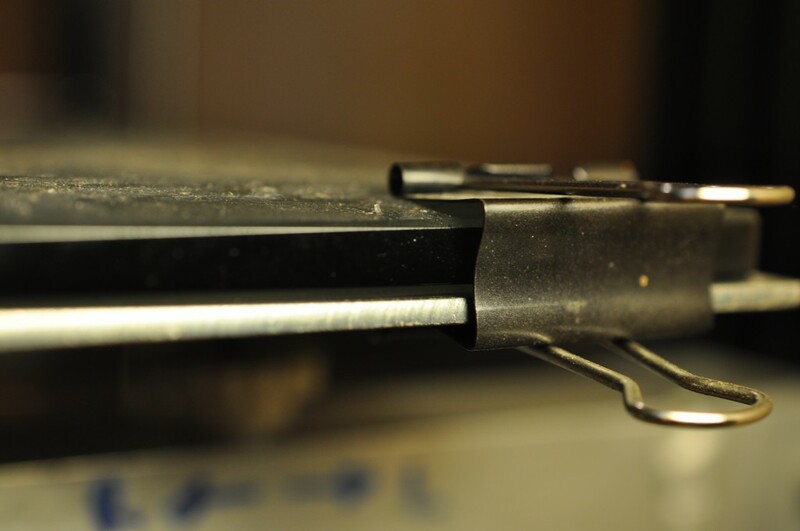 The screws allow you to push up or pull down on the build plate. The built plate assembly weighs around 40 pounds so it was difficult to find springs which would support it rigidly yet still be easily adjustable. It is a little more difficult to adjust but it locks the bed in place much more positively. I basically leveled the bed once, locked it in place and haven’t touched it since. I think this system is far superior to usual spring arrangement. Some of the thumb nuts have encapsulated steel hex nuts, but I found that wasn’t necessary. I printed them in solid 618 Nylon with a pilot hole and then tapped them with a regular taper tap. The build plate is a 24″ square 3/8″ thick tempered glass table top. It was on sale at Pier One. It is remarkably flat and with 4 point leveling screws it can be made almost perfect over its entire area. Of course I am generally printing with thicker layers than most smaller printers. If I wanted to print something at 0.1mm layer pitch I would probably need to modify the first layer to get a good stick. It would benefit from enclosure and a heated bed, but I haven’t gotten around to that. It would radiate enough heat to essentially heat the room as well. 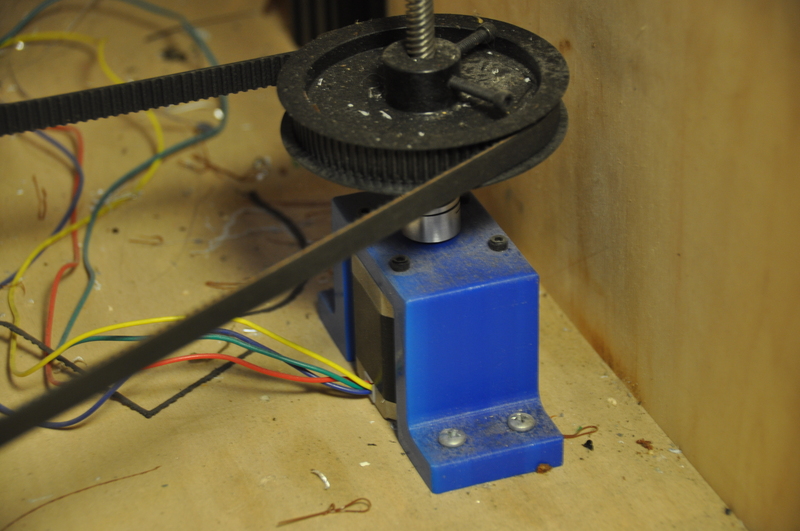 The first iteration used a NEMA 17 stepper to drive each of the two z axis lead screws. It worked fine except that when the power went off or the stepper drivers were disabled the weight of the build plate spun the lead screws and the whole thing went crashing to the bottom. The current version uses a single NEMA 23 coupled by a gt3 belt to both lead screws. I prefer this design because it keeps the two lead screws synchronized. The large sprockets on the lead screws make the z-axis extremely accurate and there is enough resistance in the system that the bed stays in place by itself. I threw it together quickly to test the system and left the old NEMA 17’s in place as bearings for the bottom end of the lead screws. They make great bearings and are cheap enough to leave them there. I could eek out a few more cm of z axis if I used a more compact bearing set up but I haven’t bothered so far. This is my rough and ready belt tensioner. It is adjusted to the right tension and then screwed into the plywood to hold it in place. The stepper is just screwed to the plywood with long deck screws. It works perfectly and costs essentially nothing. 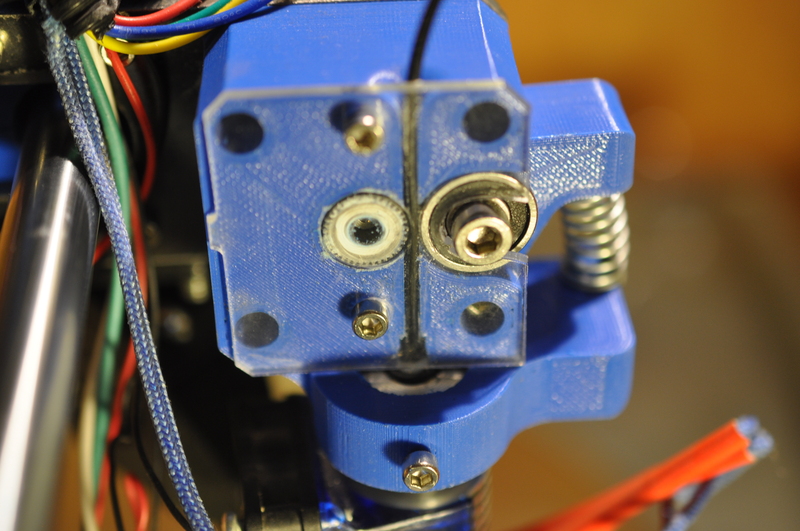 This is the first iteration of my new EZ view extruder. I designed it especially for work with flexible filament. I was sick of flex filament squirting out the side or wrapping around the drive gear. Neither is possible with this design. Plus you can see what is going on inside and easily break it down if you ever need to. It isn’t quite ready for the world but I will release the design once I am happy with it. This extruder and the leveling screw design are the two elements of this printer which I think could have broader utility. Most of the rest of the design just resulted from me improvising with what I had on hand. So how does it work you ask? With a regular .4mm nozzle printing PLA it is pretty good. It isn’t the best printer I have, but I don’t have anything else in its size class to compare it to. Not having a heated bed or enclosure somewhat limits how large a print you can make reliably. At the moment I am using it to print ridiculously large flexible prints. I am running an e3d volcano with a 1mm nozzle. 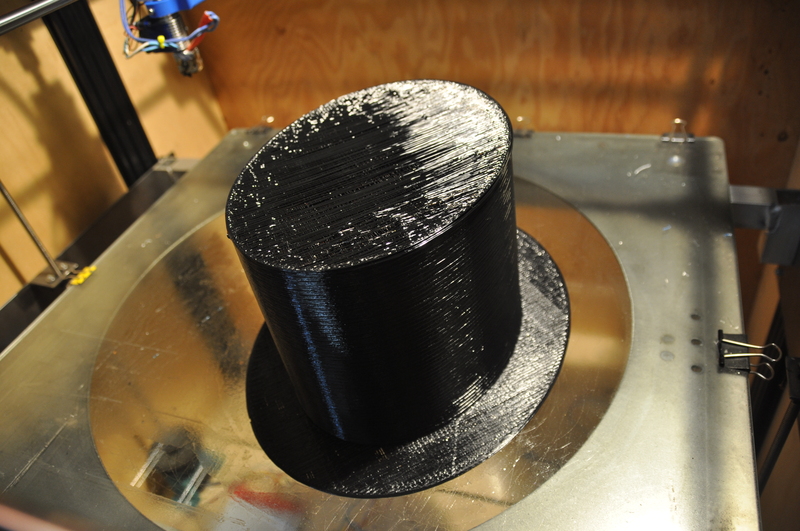 This is a wearable top hat. The print is a bit rough because I am having trouble with the new extruder design, but it prints TPU much more reliably than the bulldogXL.